The Governors Inn Hotel, a luxury boutique hotel, is not only in the heart of historic downtown Tallahassee, but also has a friendly and attentive staff that is all about pampering its guests. Tallahassee, Florida’s capital, is a stark contrast of young and old. Visitors will find both notable historic landmarks and bars full of hipsters. Conveniently located in the midst of it all is the Governors Inn Hotel. Literally steps away from great restaurants, museums, and Florida State University, the hotel offers its guests an ideal place to stay in downtown Tallahassee. The Governors Inn Hotel opened in 1983, after having once been a horse stable. It now features 41 uniquely decorated rooms and suites. As homage to its past, the hotel still has exposed stable beams above the hallways. This definitely adds to the charm of this unique establishment. I would suggest walking up to the second floor to really appreciate the beams and the structure itself. We stayed in one of the Governors Rooms on the first floor. Each room is named after a Florida governor and outside the door is a biography of the governor. Personally, I thought that was a really nice touch and for the rest of the time I was in Tallahassee I made sure to look for “my governor” when touring the various museums (I found a picture of Governor Burns and Walt Disney in the Florida Historic Capitol Museum). Inside, there was a large and very comfortable bed along with beautiful antique furniture. I loved the armoire and the small writing desk and chair. The hotel does not put a large emphasize on watching TV, but for convenience there are small TVs in each room. The hotel also provided robes and there was free (and fast) WiFi as well. Also known as The Florida Room, the Governors Inn lobby is also decorated in beautiful antique furniture. In the lobby is where guests can enjoy their complimentary continental breakfast and also where guests can enjoy the Managers Reception which offers an open bar from 5pm to 6pm, Monday through Saturday. I was not able to attend the Managers Reception during my stay, but I did enjoy the breakfast. There were bagels, cereals, yogurts, and even a waffle machine! Behind the hotel is a small terrace where guests can relax and meet up for drinks. It was a bit hot, so I can understand why no one was out when I passed through. But I would imagine that during spring and autumn, it must be a great place to gather with friends or a loved one. – The hotel provides a valet service at $12 a day. – You can park the car yourself in the Kleman Plaza Parking Garage that is one block away. – There is metered parking along the street. Because of the hotel’s great location, you can literally walk to most places so you probably won’t be using your car much. 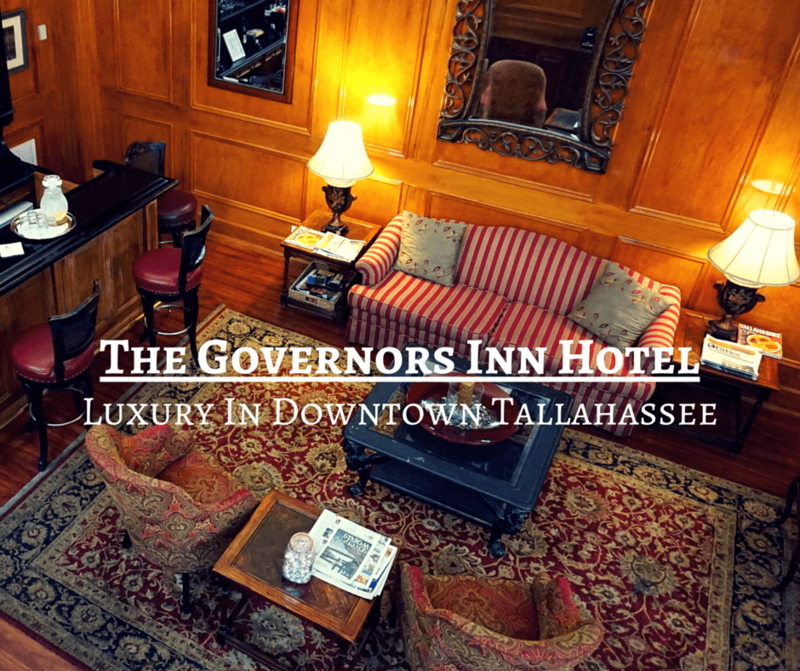 So whether you’re visiting for a graduation or a legislative meeting, the Governors Inn Hotel is the perfect place to stay in historic downtown Tallahassee. I love, love, love the exposed wood beams as part of the interior design. It looks amazing! Definitely my favorite architectural feature Maria! You know I love a good boutique hotel and the Governors Inn looks fab! I love the rustic beams and super plush bedding. Omg, I slept like a baby in that bed! Looks like a sweet refuge in the heart of Tallahasse. I love that it used to be a horse stable and that the rooms are named after governors with bios placed at the entrance! Yes, it’s such a unique hotel! I love the theme of this hotel. So vintage and classy. Brings me back to the golden era. The contrast between the old-style lounge room and the super-modern looking architecture and clean lines of the corridors are incredible! It looks and sounds like a great place to stay – I’ll remember here when I am next in the area! Yes, the contrast is really nice. Glad to hear you liked it so much! Hey Mags! I didn’t either, but I’m glad I found it. It really is such a unique place! This definitely looks like our sort of hotel! I love historic hotels – can’t believe this was a former stables! those horses lived nice! What a great theme – I love the fact that the rooms are named after different governors. Also the architecture in the hallway and lobby is really cool! I love how luxurious it is! That lobby is so vintage and classy. Gotta love those exposed wooden beams as well. Looks like a nice, quiet place to stay in Tallahassee! I’m glad you liked it Janna! I love older hotels and this looks like a great one. Feel like it would be great just to hang out in The Florida Room. Thanks for sharing. It’s definitely a great place to relax and socialize!